Our handmade HDPE batting cages are custom made to your specifications. 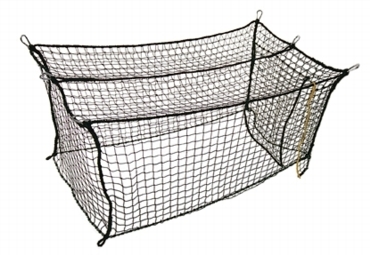 Our netting is always of the highest quality,UV resistant, high density polyethelyne, extruded black that won't fade or discolor from sunlight exposure. HDPE only loses 10% of its strength over it lifetime, thus making it ultimately ideal for outdoor use. Stock sizes of high density polyethylene (HDPE) batting cages are made from naturally UV resistant material that will not absorb water. Perfect for wet, humid, or hot climates. Our HDPE cages are extruded black that won't fade or discolor from sunlight. Hung on the square with 1 7/8" square-mesh netting, with a rope running along the surrounding perimeter of the cage. Each cage has a 7' doorway in the corner. Entry door flaps are reinforced with yellow twisted polyethylene rope. Impact screens included to absorb the impact of the ball on the net at the batters-end of the tunnel.